Buick unveiled the Park Avenue in 1991. There was a previous similar version of an Electra trim line from 1985 to 1990. Beginning in 1991, Buick Park Avenues were seen as the more luxurious and even curvaceous editions. From 1997 to 2005, the Park Avenue was Buicks flagship large sedan. Smoother lines with crisper fender tops were part of the brand’s evolution. Inside were more ergonomic controls and larger, easier to read gauges. When searching for a used Buick Park Avenue you will have two simple trim lines to choose from: the Base and the Ultra. The Ultra had an upgraded audio system, power seats and leather upholstery as standard equipment. They both could carry 6 people. Both models offered a 3.8 liter V6 with the standard engine generating 205HP and the Ultra having a 240HP supercharged engine. Both were front wheel drive via a 4 speed automatic transmission. 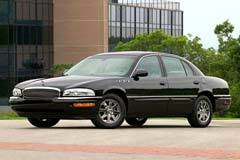 A used Buick Park Avenue is probably one of the better pre-owned car choices if you are looking for a roomy interior, excellent engine performance along with decent fuel economy at a relatively low price. 2001 Buick Park Avenue Ultra 4dr Supercharged Sedan 2001 Buick Park Avenue Ultra 4dr Supercharged Sedan 108804 Miles Silver Sedan 3. 1999 Buick Park Avenue 1999 BUICK PARK AVENUE ULTRA! ONLY 16,000 MILES! GOOD SERVICE! NEW! FL!